With the arrivals of the new harvest olive oils comes the first of the new awards and recognitions for high quality extra virgin olive oil. The 2014 Flos Olei, published early in the harvest year, is the well regarded Marco Oreggia review of olive oils. In general, Flos Olei 2014 awarded the 2012 harvest selections. It is seen by many as a watchdog of consistent quality in the industry with the idea that the recognized producers provide consistently exceptional olive oils from year to year. You can see last year’s list here. 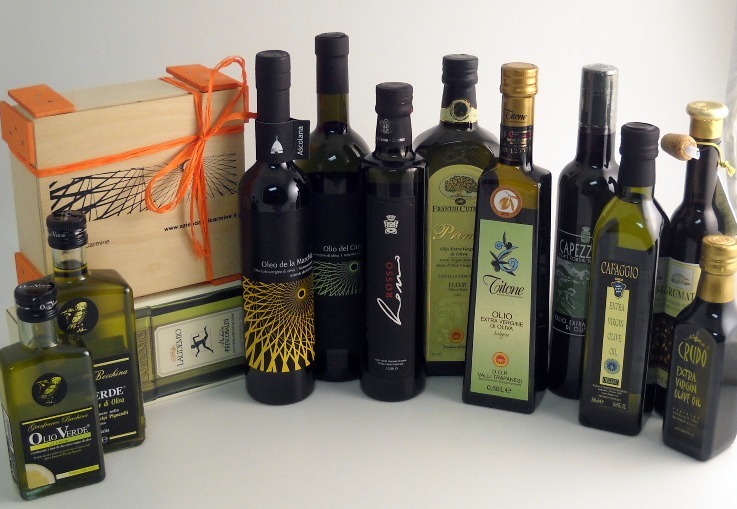 In the 2014 edition, Flos Olei’s Top 20 awards three of the olive oils we regularly carry. Most notably, we already have Quattrociocchi’s Olivastro Bio 2013, awarded Best Olive Oil from Organic Farming by Flos Olei’s Marco Orreggia. Frantoio di Riva, 2013 in stock! Fattoria Ramerino, Guadagnòlo Primus in stock! Azienda Agricola Biologica Titone, 2013 coming soon! Imagine that you spent your lifetime tending the family’s groves… toiling to prune, worrying about the weather, keeping pests at bay, and in the end, each and every year, producing an olive oil that met the high standards of the family and the regional consortia. At some point wouldn’t you want to know if your oil could compete with the best across Italy or throughout the world? So, you enter your magnificent oil in one of the top competitions, in Zurich, Los Angeles, Verona, Perugia or Trieste. And, if all goes well, years of toil will be rewarded. All will be even better if there’s a way to reach consumers of great olive oil—the wonderful consumers, reading this, who enjoy the best in the world of olive oil. We will be modifying this list as soon as additional award winners arrive in our warehouse. As soon as they are in the warehouse, links will be added. Azienda Madonna dell’Olivo – Raro – Sold out! …. all at www.olio2go.com ! With 12 Italian Award winners, we have a greater selection of winners than any other store. 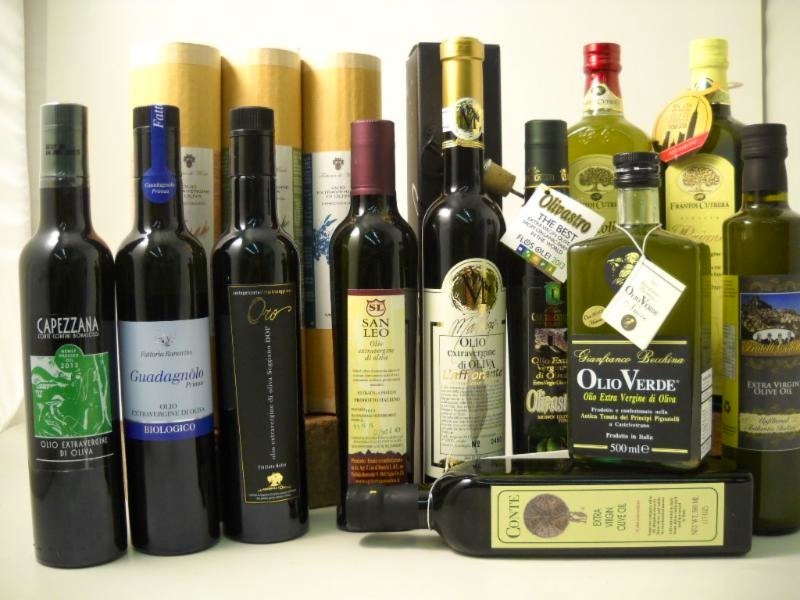 We invite you to taste these astounding olive oils! Cafaggio is available in an oil and vinegar gift set. Ascolana and Olio del Carmine may be purchased individually or within the sampler gift set. Left to right, the awards are noted below. 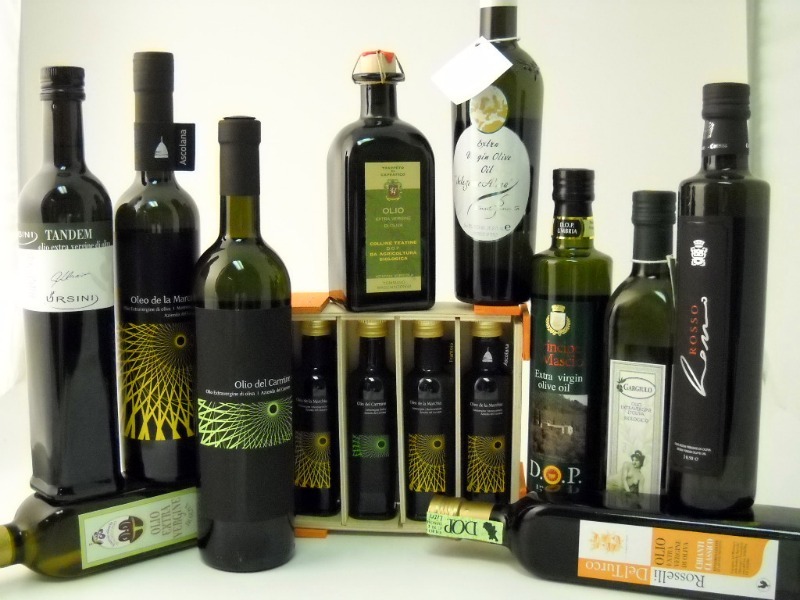 Last week we received our most recent shipment from Italy– a large shipment of olive oil (link) and one secret treat. This shipment was organized in early March, arrived in port in the U.S. on April 4, experienced a delay in customs and then was trucked to our warehouse. During that time, the dollar lost value as the Euro rose from $1.38 to $1.45. That swing adds a challenge to both purchasing and pricing. You can link to all of these new products from here. We’ve sought oils from favorite producers, recognized award winners, and a few new gems from less-discovered areas. Our new selections include gems from Brisighella to the north and Potenza to the south. The favorties include Ursini Tandem (Abruzzo), Principe di Mascio (Umbria), and three selections from Azienda del Carmine. We are very excited to add Rosso, the Gran Cru selection from Villa Zottopera. One of the northernmost regions for olive oil production is a small area of Emilia Romagna. The Brisighella region is the home to the Brisighella olive, recognized by the European Union through the DOP mark. The source of most Brisighella olives is located between Terra del Sole and Brisighella, mapped in the Provinces of Forli-Cesena and Ravenna respectively. The oil is of a superior quality, green in color with a golden glint. Our selection is Alina, a 100% Nostrana di Brisighella monocultivar. Our discovery of Bochicchio, in the area of Potenza, helps us to bring in a new taste experience from little-travelled Basilicata. Basilicata is a somewhat isolated area with only three main rail lines through the region. You could say that it is in the arch of the sole of the boot, nestled between the heel and the toe of southern Italy. The cuisine is spicy with peppers, salumi, sopressata, and remarkable olive oils. The one secret food in this shipment is Livio Pesle Balsamic Vinegar Wine Jelly. Each time we’ve been able to stock it, we’ve had strong sales with this great burst of flavor in well-designed packaging. The wine jelly was last imported by a much larger (grocery) entity and we’re sure this little gem got caught in the spreadsheets. It’s a unique specialty food item, perfect for customers seeking the finest food experiences. We like this for two reasons. It is a marvelous little gift, and a wonderful token of friendship. And the other, supremely important reason is flavor. This balsamic vinegar wine jelly is packed with intense winey grapey goodness. Place a dollop on a cheese plate and your food compatriots will want to sample it in combination with each cheese presented. This is often purchased by the case (6 jars) as it is easy to keep on hand. 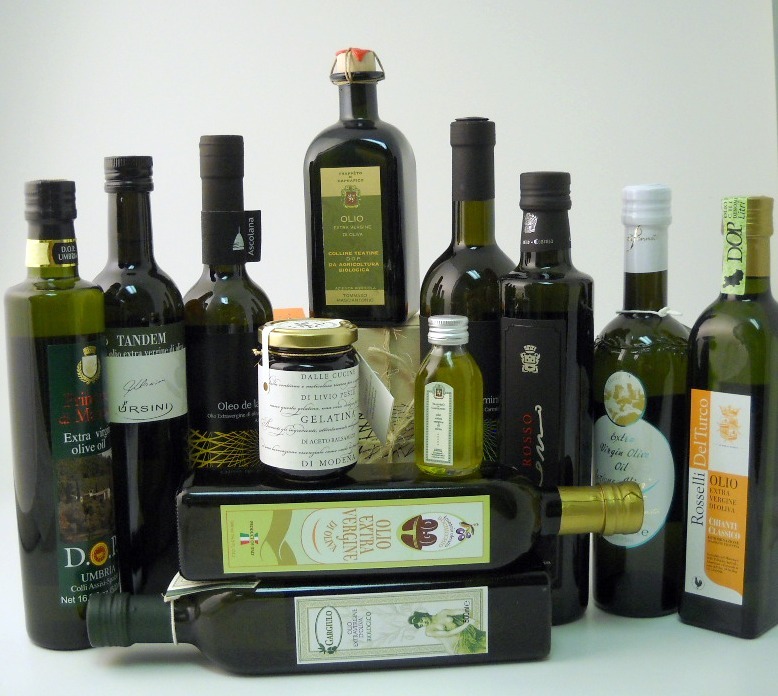 Through our search we look for authentic and spectacular extra virgin olive oils and specialty foods – all from Italy. We truly seek the top representations from each region. While we re-stock old favorites, we also seek out new regional selections. These discoveries often tell us that their placement with Olio2go is their first placement outside of Italy or outside of the European Union. How do we make these discoveries? On our trips to Italy and also through word of mouth. We appreciate customer recommendations. Some Italian producers recommend us to others. In other cases, producers seek us out because they are impressed by the size of our list and they wish to be carried on the same pages. We invite you to taste and choose your favorites. Have you been waiting for these spectacular olive oils? Take a look at this photo! All of these fresh oils (and the balsamic vinegar wine jelly) arrived this week at Olio2go. These lovely, sublime treats cover a lot of territory. From Alina (a Brisighella monocultivar from Emilia Romagna) in the north to Rosso from Villa Zottopera in Sicily. To see them all with one click, start here. The Los Angeles Olive Oil Awards were just announced and Olio2go is thrilled that we have three available at our web store. Azienda del Carmine Gift Set, a four-bottle set in a charming wooden box, including the Silver award-winning Ascolana and Leccino monocultivars, along with the Frantoio monocultivar and the Olio del Carmine blend.